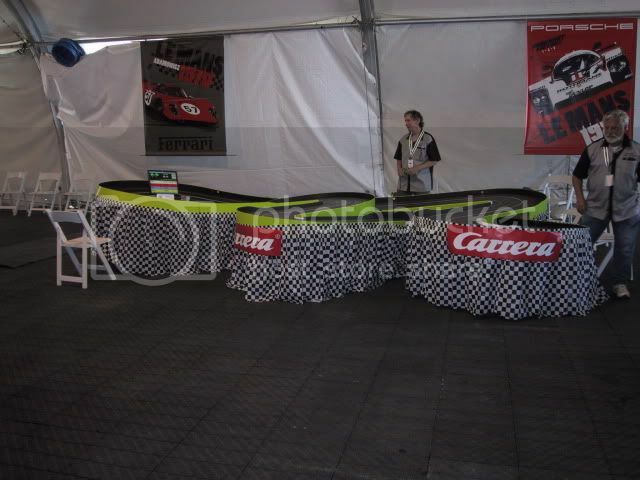 Here are pics that I took at yesterday's MS Friends Farrout Slot Cars at the Petersen event. It truly was a huge effort by many who brought it all together. 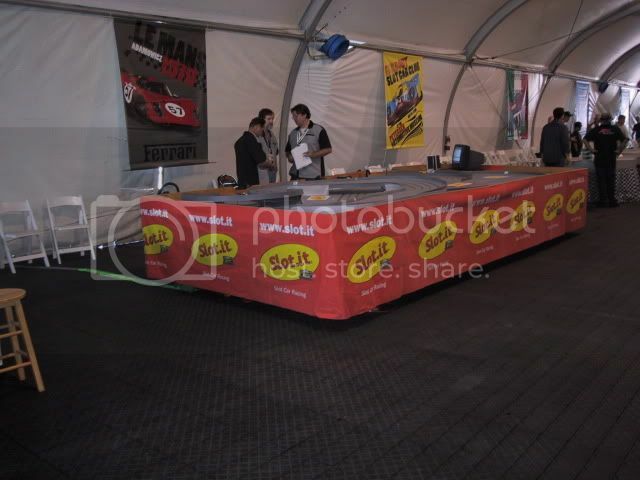 It certainly put slot cars in the spotlight AND raised some money for MS Friends, a very good thing. Special thanks to Stephen Farr-Jones and Bruce Talamon for being the driving forces behind the event, and to all who played a part in it, large and small. It was great seeing racers from Buena Park Raceway, Nomad, Sacramento, Arizona, etc. It was a memorable event. And Bob Scott just pulled up to deliver King Mini Boola. Pics to follow! Eddie great show and I loved the slide show you made, can't wait to see Keith's Pictures on top of this. have a chance to be part of it. I guess this is the best we can to do is showing a lot of pictures so they can see what happened. Man, if only California wouldn't shake so much. And I had a few mil in the bank. Looks like a great time yesterday! Hey! I would have loved to make it my-self but I'm just not road worthy yet. Gus in Sacto. Eddie's new track at the event. It was great to see you and your friends from the great state of Arizona. I hope that you had a great time playing on the museum's track with our little pocket rockets. The Arizona Garage Racers (AZGR) had a great time and we salute all of those who worked so hard to make this great event happen. Roger and I definitely had quite the adventure, since we flew in and out of LAX on the first and last SWA flights of the day on the standby tickets I won in one of our 2009 race series. (see "Fight for the Flight" in the home and club section of SB) I had planned everything out but we were lucky that all of our transportation plans worked out...I even planned for the slow and go on the 405 back to the airport. We had left my house at 5:30 A.M. and were back home just a little after 9:P.M. Quite the "Turnaround"! Mike, our other group member had fun too but he had a more relaxing itinerary and got to stay all day. I wish I could have gotten into the big race but it was still fun to participate as a turn marshal. I enjoyed seeing the guys from BP who came over here to race in '05 and enjoyed meeting some of the local club members and John Cuckras whose little cars kept me playing when the shops closed up here in the late '60s.and'70s. I was also happy to see TSR represented among the manufacturers, as you know I have a few of both scales. Now I need to win another race series so that I can do this all over again to visit LASCM and ED! Eddie, what did I ever do to you? Not ONE picture of my track??? Democracies endure until the citizens care more for what the state can give them than for its ability to defend rich and poor alike; until they care more for their privileges than their responsibilities; until they learn they can vote largess from the public treasury and use the state as an instrument for plundering, first those who have wealth, then those who create it -- Jerry Pournelle. Come on Stan, he is in love with his new toy. Maybe I can help... 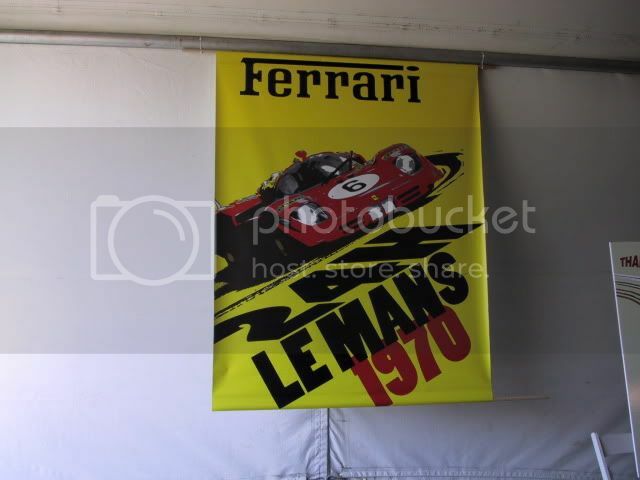 I enjoyed running the Slot-its on Stan's track and I wish I could get some of that awesome Slot-it skirting not to mention the banners hanging on the tent sides. This is what I'm talkin about...These banners are so cool! Three or maybe four would probably fit on a standard two car garage door. You guys should sell them! Stan, HONEST, it had nothing to do with fact that you had those slick Slot.it's and I had those... well... nevermind. Just a clumsy oversight in a very busy day. My apologies. That's my story, and I'm sticking to it! Now... wanna come and race??? Dave, according to Stephen, the wall hangings will be auctioned off. Stan, HONEST, it had nothing to do with fact that you had those slick Slot.it's and I had those... well... never mind. Eddie was stuck with 1/24 scale Carrera cars, you know, the ones that are so well engineered by these geniuses over there in Austria, that their guide flag can only get 1/16th of an inch in the slot, causing them to de-slot at every corner. Now now.... to be fair, I started out on Friday with the Carrera 124 digital cars, but Stephen supplied enough SCX cars from his own collection to make it a fairly trouble-free day on my track. They weren't the fastest, but they did go around and around. Eddie, I wish that you would have been able to spend some time playing with us on the Emperor... there was some truly great racing there. I love your baby King. Well Philippe you never offer me to have a chance to run on it, did you? I was mostly the celebrity's that had a chance to run on the Emperor. You want me to list who raced on it? Sure wasn't the little guy's with no fame. Nesta, utter baloney. ANYONE who wanted to play, did. From older adults to 4-year old kids. Did you even ask? We probably had 200 people who did, and I have no idea who the heck they were, I was damned too busy processing people there so that they could have a good time. I just wanted to see your reaction. Still would have love to race on it. Maybe later down the road. Hope that you know when I'm joking by now? I can't believe that you are getting hissy about a stupid comment like that? Just a clumsy oversight in a very busy day. My apologies. That's my story, and I'm sticking to it! Now... wanna come and race??? No worries, Eddie, just kidding. We were all so busy, I barely had time to even look at everything else. All of you were incredibly busy especially poor Bob Scott who took time away from his tracks to walk us around and introduce us to so many of the club members and others. It was kind of funny to watch Bob trying to race in the Le Mans race while dealing with wiring issues and helping P with timing and scoring. I've always been in awe of how much energy that old fart has. Hey Nesta,I have to side with Philippe...he even let Zonies drive on the Emperor and you know what bad drivers we can be! Everyone knows that I have absolutely zero sense of humor. I think you are wrong, I find your way of dealing with things quite amusing my self. Well let me put it this way me and Flygirl are always cracking up on your commentary. Nesta, please give her my best. I did not even have a chance to chat with her last week. Side note Dokk .... Flygirl got her job back and more.....! WTG Girl!